I hate when people leave, and two years ago, it was particularly sad when everyone Joe went to medical school with graduated and moved on to new cities. We stayed in St Louis and I wondered if I would get close to anyone new. It's particularly hard to start new friendships the older you get, especially with how busy everyone is. Lucky for us, didn't take long for us to bond with Joe's fellow co-resident M and his wife L fairly quickly, and we have shared so many tasty meals and experiences together since. When it was L's birthday, I asked her to put in her request for a dessert and she opted for a marble cake. I thought it'd be fun to turn it into a pinata cake since the rest of the dinner that night was already Mexican-themed. It was incredibly fun to make and not too difficult at all--completely worth the reaction of cutting into it! The cake is soft and not too delicate, with a wonderful buttery crumb. It's got swirls of chocolate in the cake and the chocolate buttercream frosting is to die for. You can stuff the cake with anything, really, but I like m'n'ms because they spill out nicely when you cut the cake. It would be perfect for a gender reveal, as well! 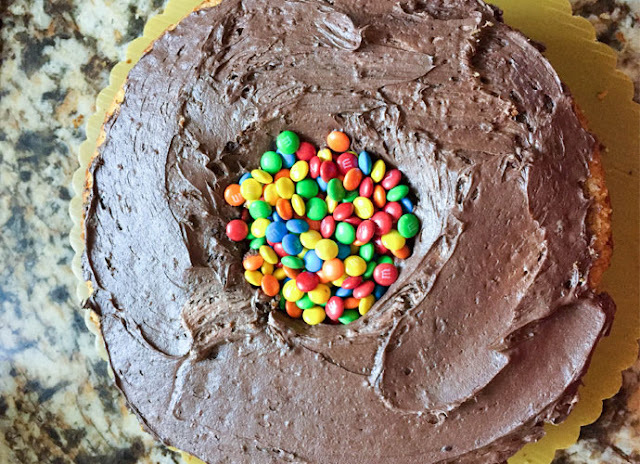 Be sure to check out Sally's Baking Addiction for details on how to make the cake--she's far better at expressing it than I am! Preheat the oven to 350 degrees. Spray 2 9-inch cake pans with nonstick spray and set aside. In a large mixing bowl, sift together the cake flour, baking powder and 1 teaspoon salt. Mix and set aside. In the bowl of a stand mixer, add 2 cups (4 sticks) butter, the granulated sugar and brown sugar. Beat on high speed until smooth and creamy, scraping down the sides of the bowl as needed. Reduce the speed to low and add the eggs and egg yolks until combined. Add the 2 tablespoons vanilla and beat on medium speed until combined. Remove the bowl from the stand mixer. Add the dry ingredients and 1⅓ cups milk and fold in with a spatula until the batter is smooth, thick and just combined. Remove 2 cups batter and place in another medium-sized bowl. Add the chocolate and stir until combined. Evenly divide half the yellow batter between the 2 cake pans. Evenly divide the chocolate batter between the cake pans, pouring into the center of each pan. Evenly divide the remaining yellow batter between the cake pans, covering the chocolate. Use a knife to gently swirl the batters together, creating a marbling effect. Bake 40 to 45 minutes, until toothpicks inserted into the center of the cakes come out clean. Let cool completely before removing from the pans. Once cool, wrap in plastic wrap and freeze at least 2 hours. Meanwhile, make the frosting. In the bowl of a stand mixer, beat the remaining 2 cups (4 sticks) butter on high until smooth and creamy. Add the powdered sugar, cocoa powder, the remaining ½ teaspoon salt, the remaining 2 teaspoons vanilla and the remaining ⅓ cup milk and mix on low. Once combined, beat on high 3 minutes until fluffy. Add more sugar to sweeten or cream to thin, if needed. To assemble, unwrap the frozen cakes and use a bread knife to carefully slice horizontally through each cake to create 4 layers. Use a 4-inch round cookie cutter or a glass to cut out a round in the center of 2 cake layers. Remove and discard the extra cake or reserve for another use. 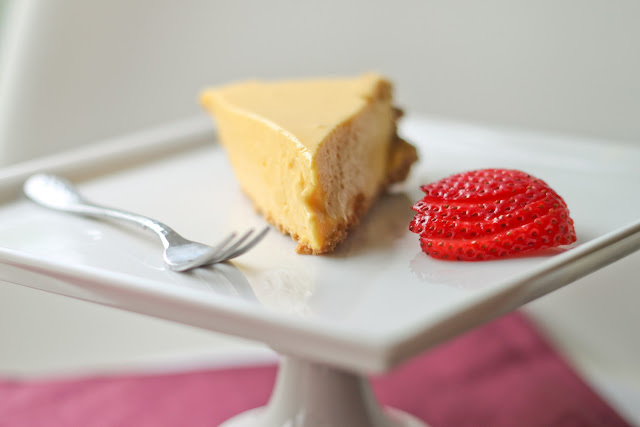 Place 1 whole layer (without a cutout) on the cake stand or serving plate. Add a dollop of frosting and spread evenly atop the cake. Add 1 layer with a cutout atop the base. Add a dollop of frosting and spread evenly atop and inside the hole, then repeat with the remaining layer with a cutout. Add a dollop of frosting and spread evenly atop and inside the hole. 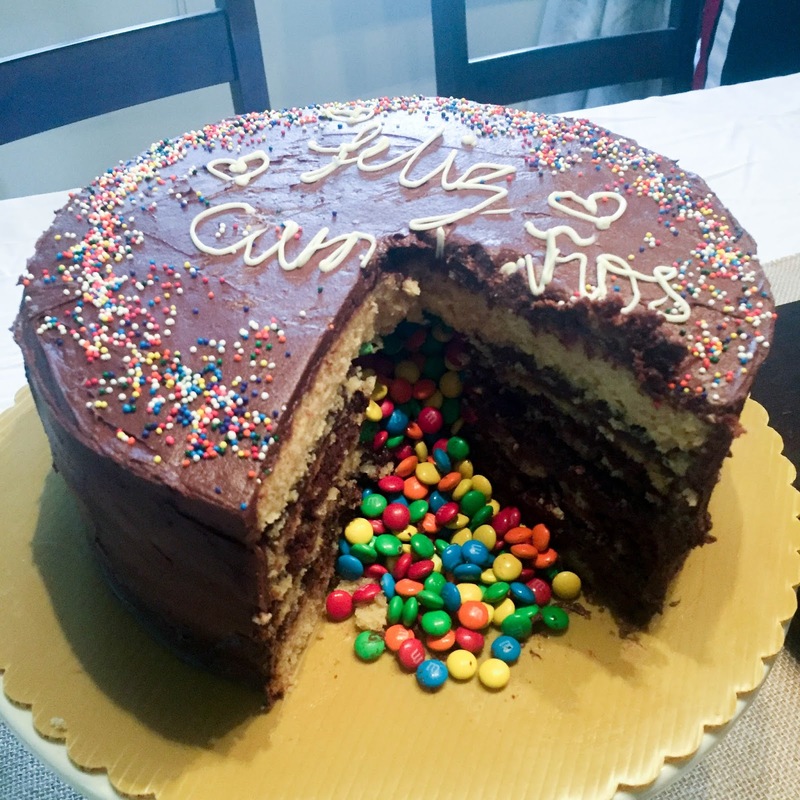 Fill the center of the cake to the brim with M&Ms. Cover with the last whole layer. Use the remaining frosting to cover the top and sides of the cake evenly. Serve at room temperature. The cake will keep at room temperature up to 1 week.